Students gathered in front of the Geological Museum Wednesday afternoon to protest a talk by controversial alumnus Charles A. Murray ‘65. The event was organized by the Open Campus Initiative. UPDATED: September 7, 2017 at 5:02 p.m.
Amid peaceful protest and a heavy security presence, controversial sociologist Charles A. Murray ’65 discussed his scholarship and President Donald Trump’s election at an event intended to “test” the boundaries of free speech on campus. 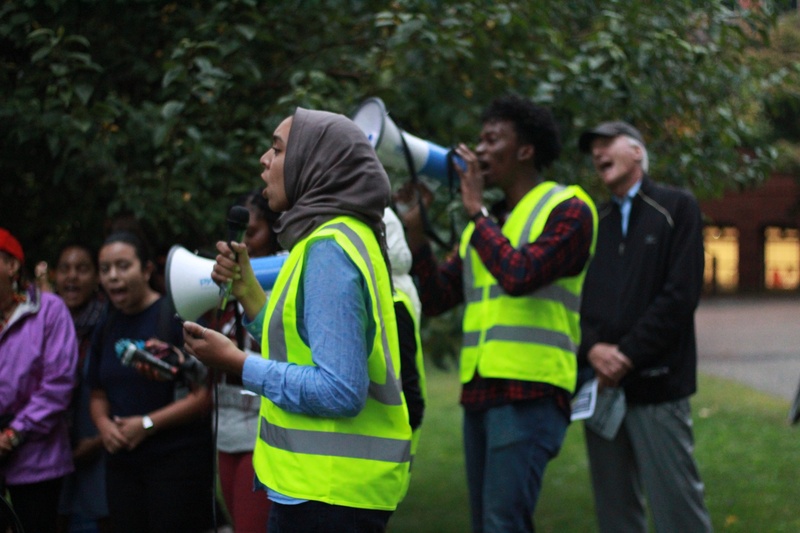 Protesters criticized the Open Campus Initiative—a group that invites what some say are hateful speakers, including Murray, to speak—for giving a platform to racist ideology. Nicholas P. Whittaker ’19, a member of the Undergraduate Council’s Black Caucus who organized the protest, said that the Open Campus Initiative gave Murray an “unchecked platform for white supremacy and transphobia” by inviting him to campus. Taya Cowan ’21, another protester, said she felt that Murray’s sentiments should not be welcome at Harvard’s campus, and that his invitation reaffirmed her belief that “the world isn’t safe” for her as a black woman. Inside the lecture hall, Murray discussed his most recent book, “Coming Apart: The State of White America 1960-2010,” which looks to analyze modern-day class dynamics in the United States. 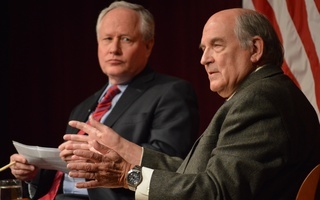 While fielding pre-screened questions from the audience, Murray responded to one student who asked outright whether he was a white supremacist. His response was brusque: “I am sick unto death of trying to prove a negative,” he said, adding that he thought his best-known book “The Bell Curve,” which claims that disparities in intelligence can be linked to race, does not actually claim that white men are intellectually superior to other groups. Midway through Murray’s talk, about ten students in the audience rose and held signs, one of them reading “white nationalist,” before walking out of the lecture to attend a faculty panel organized by the nearby protesters. 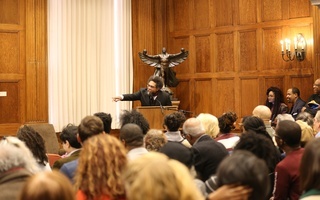 At the faculty panel, hosted directly after the student protest, History and African and African American Studies professor Walter Johnson strongly condemned Murray’s beliefs. 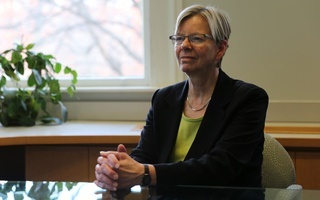 The counter-events were tame compared to the demonstration sparked by a speech Murray was scheduled to give at Middlebury College in March. Still, the memory of the Middlebury incident, which drew national attention and briefly turned violent, cast a shadow over the event. Murray himself joked about his Middlebury appearance after the students who held up signs departed the room. A previous version of this story incorrectly indicated the number of attendees at the event. This freedom of expression motion reminds all parties involved that the pursuit of truth is a collaborative one, and that groups with conflicting ideas should seek to understand rather than simply antagonize each other. At this political moment when the very humanity of people of color in this country is being questioned and white supremacy is at the forefront of American political discourse, students ought to stand with their vulnerable peers of color, and other marginalized persons, on this campus.